Many times an injured dog will find a ways to open sutures your vet spent so much time (as well as your dollars) doing or will lick it's wounds profusely, sometimes causing infection or irritation. One of the quickest, easiest and most effective ways to thwart this behavior is to take a regular old, clean, bath towel and fold it so that it becomes one long flat surface. A regular-sized towel is usually just the right size but if it is an oversized bath towel you are working with, you may have to cut it before you fold it. Once folded, take the towel and wrap it around the dog's neck. You can wrap it tightly because you probably won't be able to wrap it tight enough to restrict breathing. If you do not have vet wrap/stretch wrap you can use adhesive tape to firmly secure the towel. The dog can wear this for several days or even over a week until the wound is properly healed. You can change the towel out with a fresh one as often as is necessary or as you like. 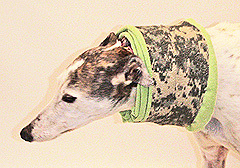 We recently used a towel collar for two weeks on one of our leg amputee dogs. Eating and drinking was much easier than with traditional Elizabethan or cone collars, but access to the wound was more difficult.